Autographed and inscribed 5” x 7” original P.Y. 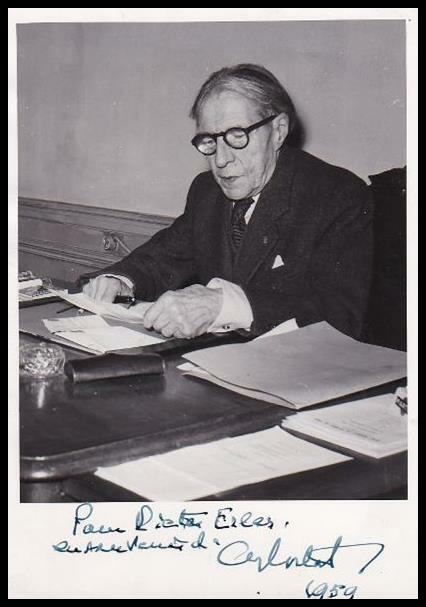 Tsao of Paris reverse blind stamped photograph of the legendary Swiss pianist at his desk at the l’Ecole Normale de Musique in Paris, 1959. He sits pen in hand reading a letter with a manuscript sized folio folder to his left. Cortot (1877-1962) founded l’Ecole Normale in 1918. Despite his problems after the War, he led the school until his death in 1962. That said in 1959 he spent the majority of his time teaching in Lausanne, Switzerland. He was known to have been in Paris in March that year to deliver a eulogy at a memorial service for his pupil Dinu Lipatti. Cortot played his final concert at the Prades Festival with Casals in the Summer of 1958. A most unusual late autographed photograph of Cortot.